So pressure cleaning is one of the many perks and responsibilities of owning a home. Much like a car and even your teeth, houses get dirty and need a little T.L.C. from time to time. When you buy your home it is mostly likely clean, but over time the trees and plants around your home can produce leaves that fall on your roof and even driveway. Overtime you will get a build up of algae and mold on the sides of the house, roof, patios and driveways. It literally makes the house look dirty. The simplest way to clean your home is having a professional pressure cleaner take care of it. 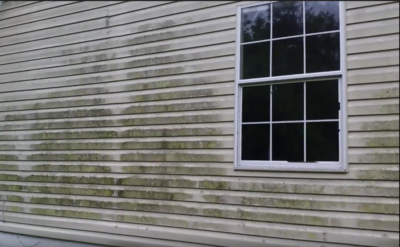 Power washing is smart preventative maintenance because if you do not take care of this it will likely damage the paint and cost you thousands to get your home repainted. If you don’t want to hire a pressure cleaning company, you could just buy a pressure cleaner yourself. It is one of the most affordable cleaning tools that you can buy from Home Depot of Lowes. Be extremely careful as you don’t want the paint to come off or you could damage a window or cause an electrical fire. We use no pressure roof cleaning techniques to get your roof sparkling clean. Using no pressure helps protect your manufacturer warranty. The gutter attached to your roof catch more than water. They catch dirt, grime, leaves, dirt and more. Get them clean. Its really simple get up on that roof and start cleaning them, because if you do not do this on a regular basis you can ruin your home.